The world of independent horror has certainly given me quite an array of experiences at my time here at Oh, The Horror. Having from outlandish concepts (Ninjas vs. Zombies, Cockhammer) to interesting, experimental film-making (Deadbox), I’m never quite sure what to expect when a screener arrives in the mail. The latest “film” to hold that distinction is Run Amuk Media’s Chuckle’s Revenge, which at first glance appears to be a standard killer clown/slasher movie. However, upon further investigation, Chuckle’s Revenge is not quite a film at all, but rather, an “interactive experience” that allows viewers to choose the outcomes of various situations as the film progresses. It’s an interesting sounding gimmick that at least serves to separate the film from the mass of other independent horror offerings out there, but is there any substance behind it? It’s Kristen’s 21st birthday party, and she’s enjoying some (now legal) beverages that don’t require the use of a fake ID for the first time in her life. The party rolls along with plenty of drinking and some drunken well-wishes for the video camera until the door bell rings. Expecting it to be a male stripper, the girls are surprised to discover a clown called Chuckle standing in their doorstep. By all accounts, Chuckle is a buzz-kill, so Kristen pulls his pants down, knees him in the groin, and sends him on his merry way. The film then ominously flashes ahead one year, where we find Chuckle still simmering about the humiliation he experienced; not content to merely sit around and dwell on the situation, he then sets out to avenge his manhood by brutally killing all of the girls. It’s at this point where the film presents the viewers options that will allow the film to unfold in different ways. For example, one sequence asks viewers whether or not our protagonist should orally service a random guy for the use of his firearm, with the consequences not becoming readily apparent until the end of the film. Of course, this feature is as gimmicky as it sounds and is more reminiscent of an old Sega CD video game (like Night Trap) than an actual film. At a couple of different points, viewers can even make “the wrong choice,” which will result in a rather brief and blood-splattered conclusion. This result especially speaks as to why this method of film-making will never be a valid one, as it treads far too closely to video game territory (though it would even fail in that realm because each scenario only presents two choices). If anything, Chuckle’s Revenge feels like an experiment, and it is thankfully a short one. The boasted screen-time is 65 minutes, but this must reflect the sum total of all the footage involved. In reality, the film clocks in at about half an hour. Unfortunately, even this half an hour is nothing extremely special. The film reflects its cheap origins and was obviously shot on video. 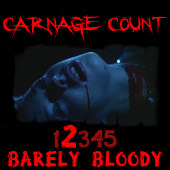 The few gore sequences are quite well done, but are sparse. The acting is pitiful, as is the thin plot, but this is of course to be expected by what is basically a slasher film. I will give the film a little bit of credit for making Chuckle himself to be somewhat unnerving as he calmly kills off his victims while laughing about it. It’s not much, but if there is a bit of a saving grace (along with its short run-time), that would be it. It goes without saying that Chuckle's Revenge isn’t very competent as a film, but, as an experiment, it’s a decent time waster. In fact, it just feels kind of like an extended bonus feature, not unlike the “Choose Their Fate” mode on the Final Destination 3 DVD. As it stands, it falls somewhere between being a short film and a video game, and the experience might be somewhat memorable in its relative uniqueness, but it still isn’t anything groundbreaking. Compounded with the fact that it features the one of the most shallow of genres to begin with, there isn’t much more to say about Chuckle’s Revenge. I suppose if you’re in dire need of a killer clown slasher that only lasts half an hour and has the added bonus of being somewhat interactive, it might be for you. Everyone else probably won’t find much to chuckle about. Only the extremely curious should Rent it! To purchase, please visit Run Amuk's website for the film.